Meditating at work can make you less stressed, more calm, and more on top of your game. Knowing how to meditate at work can make you feel more clearheaded, less stressed, and ultimately empower you to make good decisions. 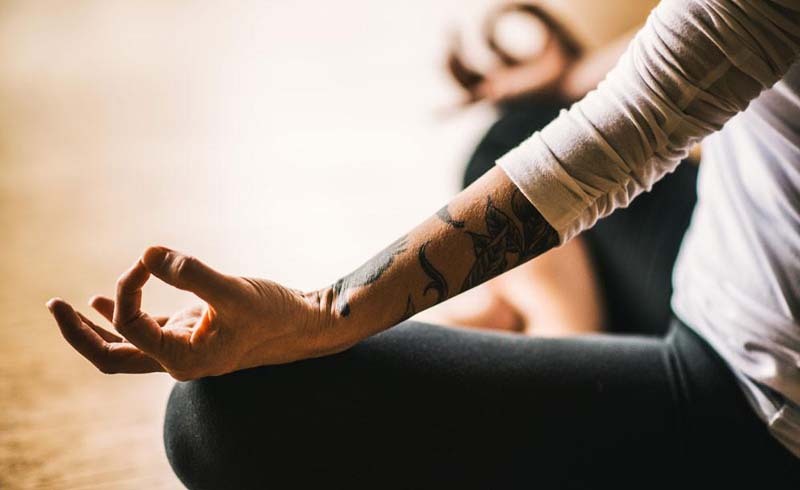 “While stress is an unavoidable part of our lives, there are definitely techniques to mitigate its side effects, and meditation is a relatively simple and cost-effective way to help keep your body healthy,” explains Katharine Miao, MD, medical director of CityMD. Does listening to The Chainsmokers calm you down like nothing else? Then make sure those tracks are on the Spotify playlist you regularly jam out to at the office. Do you feel like you only truly tune out the outside world when you’re working up a sweat? Then make sure you’ve got sneaks in easy access under your desk. If you’re new to meditation—or even just new to the concept of relaxing at work—these five techniques can calm you down, even in the most stressful work situations. The Situation: Your boss sent a “we need to talk” email. The Meditation: Before you panic, take a deep breath. Sit down in your chair and feel the weight of your body against the chair. Feel your shoulders. Feel your stomach. Concentrate on breathing in and breathing out, counting to 10 (if it helps you focus on your breathing). “By slowing down and breathing and being present with the physical sensations in our bodies and the stories we tell ourselves, we're better able to see stressors for what they really are and not get swept up in our reactions to them,” says Kait Hurley, a meditation teacher in Portland, Oregon. Sure your boss may be angry. But until you connect with her, you have no idea what she needs to see you about. Learning how to tune in and slow down can stop your panic from escalating for no reason. The Situation: Your kid was up all night and you're exhausted. Coffee isn't working. The meditation: Take a minute and sit in your chair, resting your hand on your lower belly, right above your pubic bone. Put your left hand over your heart. Then, either with your eyes closed or looking at a single point with a soft gaze, breathe in and out, allowing your mind to go where it wants to go. Turning away from your computer, or closing your laptop, can be helpful in keeping you firmly anchored in the present. Don’t get pulled away into your thoughts or get into problem-solving mode, says Hurley. “You’re not trying to get anywhere,” reminds Hurley. Instead, just tune into the wave of your breath. The Situation: You’re panicking about an upcoming meeting. 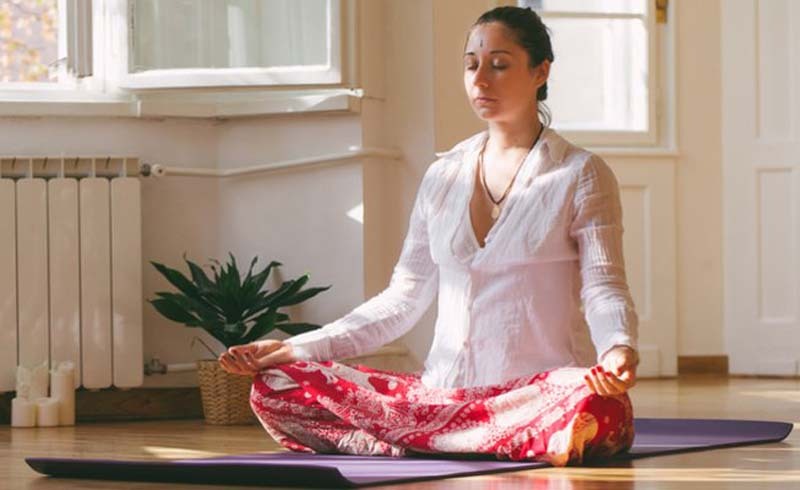 The meditation: Book a conference room, stat. If you can’t book a conference room, head to the bathroom, a stairwell, or even the elevator for some solo time, suggests Elizabeth Novrogatz, co-author of Just Sit: A Meditation Guidebook for People Who Know They Should But Don’t. “While learning to meditate in a loud, chaotic space can potentially help you keep your head in your noisy everyday life, it’s also important to be able to know you can find some quiet,” shares Novrogatz. If you’re new at meditation, a private spot can help you slip into the zone more quickly. Pick an image on your phone to focus on—could be a random Instagram of the beach or a favorite pic of your kid, or even just an abstract graphic design—and breathe. Doing so can interrupt your ratcheting anxiety and help you feel calmer. The Situation: Your to-do list is so long, you don't even know where to start. The meditation. Try to get into the office 10 minutes earlier than usual, suggests Miao. Sounds counterintuitive, but getting in early—especially if you can be the only one or one of just a handful in the office for at least a few moments—can be a great way to start your day on the right foot. ‘In the absence of your colleagues, you will be better able to relax your mind, organize your thoughts, and plan your day,” explains Miao. The Situation: You're running late to work. The meditation: Instead of panicking, listening to music or having a few go-to meditation tracks on your Spotify playlist can be helpful, says Miao. If you’re not driving during your commute, consider using part of that time to use a meditation app—ones like Headspace, Calm, Buddhify and 10% Happier are all popular options. A meditation app isn’t necessary, but the guided exercises, calming music, and simple exercises can help those who are new to meditation not feel overwhelmed by the concept, explains Miao.